Meeting Tuesday, March 8th – At the Space! Our first regular meeting at the new space will be on Tuesday, March 8th at 7pm. Meeting topics will be sort of free form, but will include a bit of orientation, some discussion on setup (which should be easier now that we’re standing there) and planning for regular operations. By Tuesday, we should be mostly ready for anything that you’re planning on bringing. At the moment, we’re most in need of furniture (shelves, tables and especially chairs), though just about anything can be stacked on the floor for the time being. Click here for directions to the space. Ok, so facility update: Â we have officially signed the lease. Â Sadly, this does not mean we will be there this Tuesday. Due to some final paperwork being done by Omar Bakery, we will not have keys by Tuesday. Â Save the rabble, we know it’s really lame. Â We start paying rent on March 1, so we will definitely be going to the Omar Bakery in March. 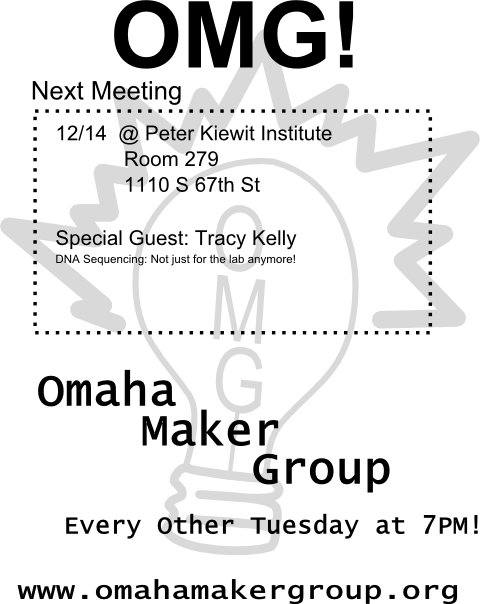 So here we go: OMG Meeting, Tuesday the 22nd, 7:00PM at the Peter Kiewit Institute room # 279. This really is the last one. Â Otherwise we are paying rent for a space that we are not in. Actual setting of plans for a big set-up-the-shop event for the first Saturday in March (March 5th). Quelling any anger over February rent. Our next meeting (7pm on February 8th) will be at our usual place, the Peter Kewiet Institute. The agenda will be somewhat free form, mostly related to planning and discussion regarding the new space. Also, there should be tales of this weekend’s field trip to the electronicsÂ recyclers. This is the first meeting of the month of February, so Dues will be collected, unless you paid in advance last meeting. My apologies on not adding in the location information somewhere on the last post. Â The upcoming meeting will be at the Peter Kiewit Institute, which is on 1110 South 67th St. Omaha, NE, 68106. Â The room number is 279. the meeting time is at 7:00pm. This is most likely our last meeting at the Peter Kiewit Institute. Â The last meeting had a nearÂ unanimousÂ vote to move into the Omar Bakery located at 40th and Nicholas. Â The dissenting votes just didn’t feel comfortable voting due to how new they were to the group.ï»¿ Given that this makes our February very busy, I imagine it would be wise to have a MAJOR parts inventory (o-scopes, computers, monitors, soldering irons, chairs, tables, etc.) done to see what we all have and need for this space. Â As adopted by the bylaws, the Omaha Maker Group is attempting to be a body that purchases a minimal amount of goods, meaning that if we need chairs, we would really like someone to donate those chairs so that we can worry about paying rent and utilities with peoples’ money. Â A good place to post the items you have that you are willing to donate is on the mailing list. Beyond that, we do not have a speaker lined up yet. Â If you have some exciting topic that your are dying to talk about, let me know and we will probably do a 30 minute talk. Â Good job everybody, we’re about three weeks from being “official”! Let’s do a Show-and Tell! A camera app for an android phone that can read clocks!